Top quality white heavyweight 2mm thick indoor cricket netting 50mm square mesh is suspended from extruded aluminium trackway. Single, double and multiple bay nets can be installed with 2m high white sight screen across the back and 4.5m along each side of each bay. A bowlers' protection net can also be included. Netting is stored in specially made PVC wall pouches. 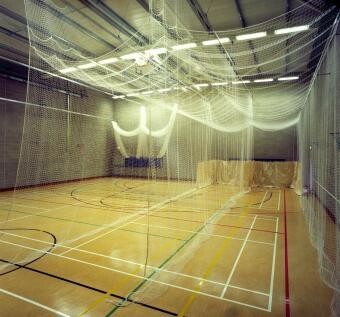 Installations can include for dividing nets, wall or roof mounted basketball goals and any other sportshall equipment.